2016’s spring and summer theatre seasons have been dominated by some outstanding leading female performances; from Sheridan Smith’s Funny Girl to Billy Piper’s Yerma and Helen McCrory’s Hester in The Deep Blue Sea (which gets an NT Live cinema showing this week) this is some of the best work we’ve seen in London for some time. But autumn is almost here and it’s time for our leading men to step into the spotlight. Over the next few weeks a number of highly anticipated shows will open – Ian McKellen and Patrick Stewart bring their No Man’s Land tour to the Wyndhams, while Ken Stott and Reece Shearsmith take on The Dresser at the Duke of York’s. 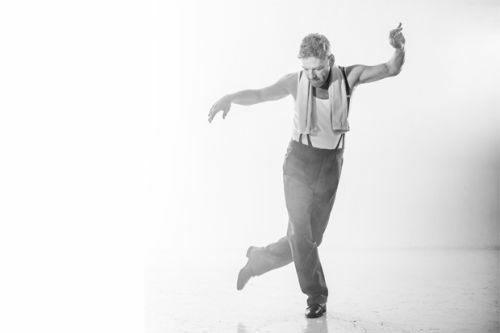 But before any of them Kenneth Branagh gives his take on John Osborne’s The Entertainer, the final play in his year-long Garrick season, which has its press night tomorrow. Set in 1956, it’s the tale of middle-aged Music Hall entertainer Archie Rice, who continues to tread the boards in a comedy end-of-the-pier show in a northern seaside town. He lives with his second wife Phoebe, their two sons and his father the renowned, and now retired, Music Hall star Billy Rice. One weekend Archie’s daughter Jean, from his first marriage, comes to visit from London and the precarious balance of illusion and deliberate ignorance that has sustained the family is shattered. Osborne’s plays are often hard to really love and even 60 years on the brutal nature of his characters can be uncomfortable to watch. But while there’s plenty of West End theatre that will harmlessly entertain you, very little sends you out into the night troubled by what you have seen, this production of The Entertainer does just that and it’s a very good thing. At the time Osborne wrote this play Britain was undergoing a period of considerable change as old and new values began to clash across the political and social spectrum. Rationing had only recently ended and the old Britain of Empire and showmen like Archie was essentially bankrupt. Much has been made in the pre-press about its echoes in current issues, and watching the show now its relevance to our own times, with Brexit and Scottish independence once again pitting old against new, is stark. The Union flag is a frequent motif as it was in the Music Hall, either waved in Archie’s act, representing the armed forces or projected across the back of the stage… and how complicated our own relationship with that symbol of Britain now is – it doesn’t mean quite the same thing it did two months ago. Who we are as a nation and how much we value tradition over progress are questions as important to us now as they were to Osborne in the 1950s. And what this version of The Entertainer is doing is seeing that play-out in microcosm in one family deeply affected by a future they can’t control – seem familiar? Once again I heard another audience member call this ‘obviously dated’ which, as with the recent discussion about Present Laughter, is a misunderstanding. The Entertainer is set in the time it was written and where it feels stale is a deliberate move by Branagh and director Rob Ashford to show that Archie is a man out of his time. In fact his refined working class family worry about the future but live almost entirely in the past, recounting old stories and existing within the confines of Archie’s long out-of-date act. And, alongside the political references, like Present Laughter, it has much to say about the expiration of celebrity, how quickly it disappears and, for those like Archie, even now, clinging to a desperate C-List status is better than none at all. Christopher Oram’s has done some excellent design work during this season but The Entertainer is one of his best, setting it in a shabby and faded Music Hall with a giant curtain dominating the back of the stage where Archie often appears with dancers to perform his routine. Brilliantly, the Rice household exists in a combined ‘backstage’ and ‘onstage’ set-up which allows Ashford to fluidly move between the home and stage scenes, with dancers neatly moving furniture into place. It makes perfect sense for them to ‘live’ in the Music Hall which has economically sustained them and shaped their lives, nicely exploited with occasional freeze-frame moments as Archie delivers his gags around them, tying the two sides of his life together. You’ll undoubtedly hear a lot in the coming days about Olivier’s take on the central role and how Branagh compares, but undoubtedly he has made this part his own, incorporating everything he’s learned from his roles during the season to create a sad wreck of a man. His Archie is someone able to fool himself he once had everything and finding it increasingly difficult to hide the truth, an element of his Leontes in The Winter’s Tale. In many ways Archie is a version of Arthur Gosport in Harlequinade, a second-rate actor committed to the theatre, but Branagh’s Archie is only too aware of his failings, while the wonderful comic timing and joy he used to great effect in The Painkiller he warps slightly here as Archie’s show-time pieces are deliberately just out of sync or mistimed by a second to expose him. Archie is performing almost always, especially in front of his father where jokes and stories are relayed in the same patter he uses on stage but there are wonderful moments when Branagh subtly allows something to catch in his throat, to suppress an emotion he refuses to feel, and in Act Two when Archie unleashed a tirade about being ‘dead behind the eyes’ and talks of not feeling anything, knowing the people watching him don’t feel anything either, it’s an incredibly exposing and affecting moment which certainly makes this audience feel for him. While Branagh has hinted at this before, from that point you see Archie’s struggle, how the affairs, drinking and dodgy deals are all part of the way he fools himself rather than admit he’s never been the man he wants to be and indicate the extent of his self-loathing. It’s an aching and profoundly moving performance. Gawn Grainger replaced John Hurt at fairly short notice in the role of Bill Rice and its one that grows on him as the play progresses. He is a key force in the play and while a lot of time is spent waiting for and relying on Archie, it is Billy that the household actually moves around. He represents a very old guard – racist, faded and accepting his time is done but still an aspiration for his son. Grainger has the cantankerous side of Billy but needs to draw out the pathos as the run progresses. Greta Scacchi has that balance just right as Archie’s feeble and highly-strung wife. She’s a permanently anxious presence, well aware that her dallying husband no longer really loves her but like him chooses to hide from the truth, but in gin – and if you attempt a dangerous drink along with the characters then you could be in a pretty sorry state. Always on the verge of tears and regretting a wasted life, Scacchi is a perfect piece of casting. Less so is Sophie McShera who brings very little to the crucial role of Jean. Her initial scenes are quite flat and then everything else becomes a little shrill and surprisingly lifeless. She lacks the youthful fire that this character heralds and the important contrast of big city life, change and the future that she represents. Again she’s meant to be a character out of time, but looking forward unlike her family and there has to be real angst as Jean debates a life of old or new. With the summer holidays officially here it can be difficult to find places to go that aren’t already full of people with hour-long queues to get in. But for anyone looking for a quieter spot or even just a quick lunchtime stroll away from work, there are a couple of fantastic and entirely free exhibitions on offer tucked away in two of London’s busiest areas. South Kensington is prime museum territory with the Natural History Museum, Science Museum and V&A on neighbouring corners of Exhibition Road, but venture a further 5-10 minutes up the road and you reach The Serpentine Gallery which has two sites in Hyde Park, both free, close to each other and open every day. Each year between the Albert Memorial and the Lake, the Gallery creates a temporary structure that dominates the park skyline for visitors to explore and enjoy, but look behind it and you’ll see one of the permanent Serpentine Gallery buildings, currently hosting an exhibition by American artist Alex Katz, entitled Quick Light. Predominantly known for portraits, Katz is now 88 and, like the slightly younger Hockney, continues to produce and exhibit his work around the world. After positive reviews for this small show I was intrigued by this combination of recently created large portraits and slightly lesser known landscapes, and was delighted with what I saw. This show is predominantly scenes of the changing seasons and different impacts of light in various rural and urban settings which dazzle far more than the Pop Art-brightness of the people. Time Out noted that Katz’s landscapes have long been undervalued and it’s impossible to see why in this wonderful show. Immediately your eye is drawn to a black piece with bright, almost impressionistic, cerise flowers that have a sharp angular quality with dashes of green to imply stalks and leaves, called White Impatiens 2 (2012). In fact this defined shape of leaves and branches is a real feature of the work that follows and even in recurring scenes of a red house, it is often ensconced if not obscured by elements of the landscape. The dynamic Red House 1 (2015) is an aerial view with a vertical grey road carving through the scene, while the titular house sits amidst a mass of green dots, lines and swirls that imply a bustling abundant landscape. It appears again in Red House 3 (2013) nestled against a bulging view of nature that presses into and almost consumes the building. But the very best pieces are those which depict night time city views, often seen from the perspective of parks or avenues. The painting entitled January 7pm (1997) shows a latticed window lightly obscured by a branch, through which you can see reflections of moonlight and streetlights in the glass. Katz’s particular use of light in these images really sets them apart, and you see it again in the incredible City Landscape (1995) which is arguably the best piece on display. Katz makes you the viewer, standing in the middle of park at night observing several perfect circles of light dotted between the bare tree branches. Clearly a winter scene, his use of deep blues and greys to convey the woody darkness of the park is beautifully contrasted by the thin silver lines on the central branch and trunk to indicate where light falls. It’s absolutely stunning, and, as with so many paintings, a reproduction image on the internet cannot match the impact of seeing the original. I was far less enamoured of the portraits, all on bright orange canvases showing singular poses or the same women in a variety of stances. They’re simple and, like the Hockney exhibition, the quality of the perspective and shaping isn’t perfect but they do have a stark and simple charm, particularly in some of the facial expressions. Anna (2015) feels especially insightful as the subject stares directly at you with an almost penetrating glare. But hanging next to the landscapes these portraits pale in comparison and although they play with colour and approaches to symmetry, it is the landscapes that make this worth the additional 10 minute walk from the main museums to Hyde Park. In another part of London, the Imperial War Museum is a huge summer attraction for families and is a short walk from Waterloo and Parliament Square. And if you’re heading there then the war movies exhibition is well worth a visit. But if you’re looking for something a little calmer than Damien Hirst’s Newport Street Gallery has a show dedicated to the influential American sculptor and artist Jeff Koons which runs until early October. 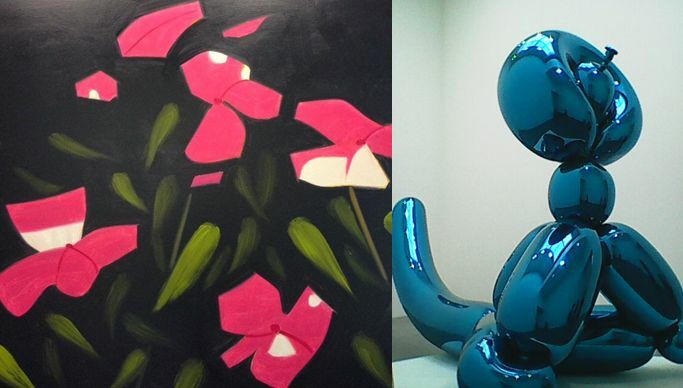 Famous for his Pop Art influences, this brings together some of Koons’s large scale works that make for a fascinating wander through consumerism and technique. Over two floors this fascinating show focuses on what constitutes art, looking at the value of everyday and novelty objects. Koons’s work attempts to break down pre-conceived notions of function to see the design and style that are also part of the object. The first gallery contains a number of his vacuum cleaner pieces that celebrates new technology and strips the items of their utility by putting them on display without ever having been used. Once the epitome of modernity, these vacuum cleaners are now, and were quickly, replaced by newer versions, so here they manage to look both old and untouched, telling us much about rapid consumption patterns and our constant hunger for novelty. One of the most astounding and enormous pieces dominates the second gallery, and is a masterpiece in confounding your expectations. The whole room is dominated by an almost six meter high sculpture called Balloon Monkey (Blue) created from 2006-2013 which looks as though it’s made of burstable balloon plastic, but is actually cleverly fashioned stainless steel and colour coating. Even very close-to it’s almost impossible to tell with the various bulbous and twisted areas perfectly replicating the stretched and creased look of a real balloon creature. It’s a technically impressive and fascinating piece of work allowing Koons to comment on our obsession with appearances, how things are not what they seem on the surface. Walking around this giant creature, your own image is repeatedly reflected back at you which is a common theme in his work. Similar technique is applied to his ‘inflatables’ in the upper galleries which adopt this same approach to disorientate the viewer. At astonishingly close range they look exactly like pool toys, with that very precise rubbery reflective surface, as though they are full of air. But each one is made of, presumably reasonably weighty, aluminium and skilfully painted to belie their own material and like Balloon Monkey (Blue) Koons is playing with how the eye perceives density and structure in a succession of works created between 2003 and 2009. Sling Hook suspends two toys from the ceiling, while Seal Walrus (Chairs) incorporates the bodies of two toys into a stack of apparently plastic chairs, retaining their inflated look even when they should be crushed by their surroundings. Finally Acrobat places an upside-down lobster with its claws balancing on an up-turned bin and a chair – in a way that a genuine inflatable toy would find impossible. There are a couple more of these effects in Gallery 6 which look to childhood influences and are reminiscent of the character balloons you see at fairgrounds. Elephant (2003) and Titi (2004-2009) reflect the same ideas as Balloon Monkey (Blue) with a high polish finish distracting the viewer from their heavy stainless-steel construct. The rest of the pieces in the exhibition are interesting but somehow seem less technically impressive, although the creation process is probably just as involved. There are some rather dubious pornographic shots in Gallery 3, so not something to take the family though, and Gallery 4 has a variety of alcohol-related exhibits also made from stainless-steel which unlike the inflatables is made to look like a luxury item. Jeff Koons Now is a short but highly entertaining show that is well worth a detour to the backstreets of Lambeth, which even on a Sunday was reasonably quiet. With two fascinating exhibitions by well- known artists in busy areas you might want to give the big museums, and their queues a miss, and head for something a little quieter this summer. Just don’t tell anyone! Fan fiction is a rather pejorative term, but it can take many forms. While Graham Norton enjoys bewildering his celebrity guests with some of his wackier finds, there are some expressions of fandom that are recognised and acceptable forms of art. For example, several classic novels have been extended or fleshed-out respectably by later writers from P.D. James’s murder mystery Death Comes to Pemberly imagining the future marital wranglings of Elizabeth and Mr Darcy with the Wickhams, to recent novels with new cases for Poirot endorsed by the Agatha Christie estate, or the new Bond novels by leading thriller writers like Jeffrey Deaver and Anthony Horowitz, as well as a highly literary attempt to write like Fleming by Sebastian Faulks. Over at Somerset House a different kind of fan art is taking centre stage, inspired by the movies of Stanley Kubrick, a director and creative known for his visionary and often challenging work. While many move through different genres, few develop a style that is so distinctive and identifiable whether it’s a horror film or futuristic space odyssey. And it is still a rarity for the film’s director to outrank the actors, so Kubrick is part of a small elite – arguably including Hitchcock, Spielberg and further back possibly Wilder – whose name is associated with a particular style of film-making and reflecting a body of work telling the cinema-goer exactly what tropes to expect. With Kubrick then, you expect strangeness, a heightened sense of a world that often includes danger, violence and fear, as well as the particularly shrewd use of music and cinematography to enhance a general sense of unease. Needless to say then that some of the more successful artworks inspired by Kubrick, on display at Somerset House, tap into these notions while referring to specific films, phrases and moments as well as the whole body of work. This is, in a true sense, real fan fiction that pays homage to its originator, assuming that the viewer is a fellow fan who will recognise the reference, but takes on an imaginary life of its own at the same time. The most extensive piece is right under your feet from the moment you arrive; created by Adam Broomberg and Oliver Chanarin, a lino-version of the carpet from The Shining guides you along the main corridor of the exhibition leading to the many side rooms containing the rest of the work which is in itself reminiscent of the infamous hotel. The bold orange and brown geometric design recalls the disconcerting effect of the film for the viewer, as well as essentially making you a character walking along it yourself – although the exhibition is so busy you won’t be alone long enough to feel afraid. Another major highlight is In Consolus – Full of Fear and Hope (2016) by James Lavelle and John Isaacs, featuring Azzi Glasser which poses two enormous, and quite frankly downright sinister, teddy bears on Pop Art-esque grocery boxes. One of them is wearing heart-shaped shades and holds a lollypop with inward turned feet like a shy little girl, while the other in a swiping pose holds a riding crop in one hand while wearing a mask with exceptionally long nose and pants. The notes tell us it represents ‘loss of innocence and abuse of power’ which was a big theme for Kubrick and this fascinatingly dark piece recalls elements of A Clockwork Orange, The Shining and Eyes Wide Shut. Another sculpture is also one of the key things to see, Doug Aitken’s Twilight (2014), essentially an old American payphone from Dr Strangelove but this is bright white and illuminated from inside, set in a room entirely surrounded by mirrors. The light throbs at varying beats building to a brilliant white glow, again implying Kubrick’s heightened realism with touches of Hitchcock’s eye for style. Mat Collishaw uses some simple physics to ‘trap’ a video of a monkey inside a space helmet to explore the interaction of past and future, while Stuart Haygarth’s tower of electric fires, Pyre (2016) dominates the second room, emitting more heat than needed in the already stifling exhibition space, but makes for imposing, devilish and slightly overbearing viewing in a show that is as outlandish as it is celebratory. For a show that appreciates a set of particular films, it’s interesting to see a number of short video installations inspired by Kubrick’s work. And while some of these are a little long for their small standing space, best among them is Toby Dye’s The Corridor (2016) which takes a number of Kubrick-inspired characters and plays out a scenario on four giant connected screens that surround the room. Each shows a different story being enacted in the same space but at times each of the characters interact, ‘falling’ momentarily into one or more of the screens next to them. It’s a fascinating piece of work and completely mesmerising to watch these soundless characters interacting, running or fighting, drawing attention to Kubrick’s own recognisable techniques. You may also spot actors Aiden Gillen and Joanna Lumley in two of the starring roles. Another famous face to pop up is Cate Blanchett in a strange science-based tale by Julian Rosefeld set in a futuristic building. The recent passion for slow TV plays a part here as we watch various capsule-shaped lifts rise and fall, before following the heroine around a swirling staircase before entering a room covered in cone shapes and dominated by a random black mass in the centre. While referencing 2001 Space Odyssey it is also truly bizarre, not least for Blanchett managing not to blink during an inordinately long close-up recitation monologues. And there’s a great mini-film created by actor Samantha Morton on her experience of watching Kubrick as a girl. There’s plenty of other interesting work on offer too such as Iain Forsyth and Jane Pollard’s Requiem for 114 Radios (2016), a sound installation that plays individual voices together to form a piece from a Catholic Mass. It’s a crackly and unnerving experience but fascinating too as apparent harmony is broken up by white noise and distortion, emphasising the experience of music in Kubrick’s work. 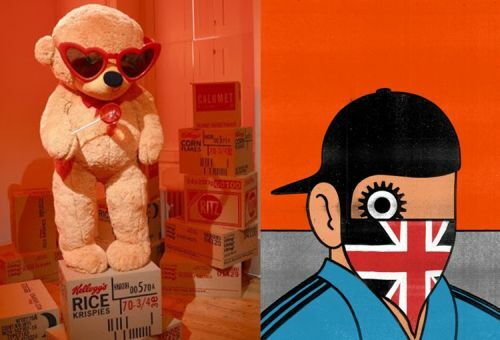 On the walls, A Clockwork Britain (2012) by Paul Insect shows a face half covered by a Union Jack scarf with the famous painted eye and hat from A Clockwork Orange and is a fascinating reference to the persistence of violence in modern society, while Jason Shuman’s single visual depiction of every frame in 2001 Space Odyssey (2016) has a serene marbled quality that belies the highly technical process of creation. As with most exhibitions, there’s plenty of works that will make you shrug and move along. Jane and Louise Wilson’s film about the never-completed film The Aryan Papers is surprisingly tedious and unvarying given its subject, and Seamus Farrell’s collection of glassware with film titles isn’t worth pausing for, while Norbert Schoerner’s virtual reality experience had a large queue but perhaps a little underwhelming in the end. For Kubrick fans this is probably the must-see exhibition of the summer, and like last year’s beautifully curated show about The Jam, Daydreaming with Kubrick is insightful and celebratory. There’s a huge amount of imagination on display and the diversity of exhibits – painting, video, sculpture, sound installation, immersion and 3D visualisation – make for a really eye-opening wander through the gallery. Above all, the huge love of Kubrick comes across, particularly the numerous ways in which his body of film has inspired fans to create further works of art. Fan fiction it may be but it redefines the term and is certainly not something to scorn. So whether you’ve seen every second of his work or don’t know his films that well and miss many of the references, this show allows you to appreciate the influence and impact of a visionary director. The opportunity to see old and new forms of theatre side-by-side is one of the things that makes London so interesting. In neighbouring playhouses you can see centuries old versions of Shakespeare or Greek tragedy set in either their traditional or modern era, while right next door can be cutting-edge new writing that in technique and presentation dispenses with all accepted theatrical forms. And debate rages between those who feel the West End is stuffed with ‘safe’ classics that attract an older audience and those objecting to noisy new-fangled pieces designed to entice a new generation to the theatre. Tried and tested plays are a staple of Britain’s theatre landscape, and are as necessary to the popularity and survival of commercial theatre as new writing. During the interval of Present Laughter making at pit-stop at the Richmond Theatre during its national tour, a fellow audience member described the play itself as ‘terribly out-dated’, and this seemed to me not only as an entirely unfair statement about a play that in our celebrity-obsessed world still strikes a rather pertinent chord, but also as a criticism that is only ever levelled at our poor inter-war playwrights like Coward and Rattigan writing about the upper-middle classes. And the same people who yawn at the ‘dated’ nature of this play also baulked at the ultra-modern update of Faustus by Jamie Lloyd and Branagh’s cinematic Romeo and Juliet, so what can you do? Whether a production feels stale entirely depends on how relevant its themes are to the way we live now or how innovatively its scenes are reimagined for modern audiences, and actually has far less to do with the language of the play then you might suppose. No one would ever say that Shakespeare was dated, or Chekov (as the fascinating transfer of Platonov, Ivanov and The Seagull have proved at the National Theatre), or even now Arthur Miller (as the searing A View from the Bridge and the recent No Villain showed), yet no one still speaks in the ways their characters do, if they ever did. Coward’s plays may look and sound a million miles from who we are today but, like Jane Austen, they are filled with biting satire and deep reflection on the nature of personality and social interaction. 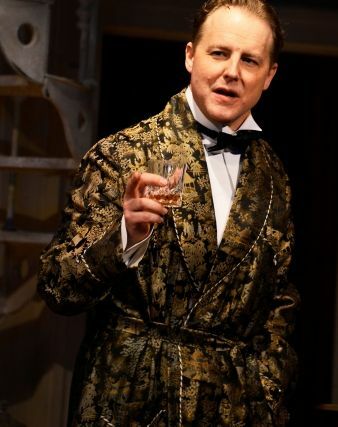 Certainly productions may be overdone or made to feel a little dusty as a recent production of Hay Fever did, but this version of Present Laughter from the Theatre Royal Bath is a sharp, sophisticated and fiercely relevant comment on star players, ego and community. Garry Essendine is a famous actor who recently turned 40 but is unable to throw off his more insalubrious habits such as seducing devoted young women and promising them eternal affection…until he wakes up the next morning. As the play opens Daphne has spent the night and the ever theatrical Essendine is trying to get rid of her amidst a crowd of callers including his ex-wife, his producer and other fans. As the actor prepares to depart for a six-play tour of Africa, he is bombarded by demanding visitors – from wannabe actresses, star-struck writers and other men’s predatory wives – while his poor secretary tries to keep him on the straight and narrow. There are very few actors who are worth an hour’s travel but Sam West is certainly one of them and his Garry Essendine is a delightful combination of frustrated petulance and wild self-love, a public figure exhausted by his own image. He complains bitterly that everyone around him is either acting a part or endlessly intriguing, before switching in and out of various romantic characters himself to rid his living room of whoever is in his way, while engaging in numerous affairs. Although the show builds to a farcical conclusion as Essendine balances his multiple women, West brings out the darker side of Garry’s life, producing a physical pang when Daphne describes him as lonely. And through that we see the character become far more than a light comic lothario and instead West makes him a man constantly surrounded by people but emotionally alone. Suddenly his nightly exploits become more about his own fears and emptiness than a callous disregard for the women he attracts. Yet West balances this perfectly with the role’s humour and while we see so much more to this Essendine than we initially expect, he remains a crotchety, complex and ultimately selfish man caught up in a mess of his own making – a finely nuanced and utterly enjoyable performance. The people surrounding Garry are equally entertaining, part support network and part parasites of his fame. Downton’s Phyllis Logan as the seen-it-all secretary Monica Reed is particularly effective as she attempts to guide her star-employer through his appointments while raising a cynical eyebrow at his latest conquest. Logan has a nice partnership with Rebecca Johnson as the estranged Mrs Essendine who makes every attempt to keep Garry out of trouble and clean up after him while retaining a best-friend like confidence. Of the mistresses, Zoe Boyle is excellent as the predatory and unashamed Joanna Lyppiatt, the snooty and arrogant wife of Essendine’s producer Henry. In many ways Boyle’s Joanna is clearly a female-version of Garry, unconcerned by the havoc she wreaks and it seems entirely appropriate that eventually the two of them would connect. But she also clearly has her own drivers to be a recognised part of their set and to get whatever she wants regardless of the consequences. Of the male roles, Patrick Walshe McBride’s Roland Maule, the young writer who connives at a chance to meet his hero, is the only one hitting a false note with a performance that is too broad for Stephen Unwin’s subtler take on this play. Simon Higlett has created a traditional but beautiful set, dominated by a spiral staircase and a Dorian-Gray-like painting of Essendine which hangs over proceedings on the upper level. It’s an easily missed but pointed statement about the relationship between youth and fame, and the hero’s behaviour has much to do with fears of ageing. Again, some may call Higlett’s approach ‘old-fashioned’ and it would be fascinating to see a stripped-back version of Coward, but rather than just create a pretty vision, a good set should reflect both the themes and characterisation of the play which Higlett’s certainly does, and its tone of showy-chaos gives plenty of additional visual clues about the nature of Essendine and his lifestyle. So is Present Laughter outdated, well no actually, it has as much to say about the fawning nature of celebrity now as it did in 1939. Our gossip columns are full of Garry Essendines dating a string of younger women and having tantrums aplenty, while messageboards, comments sections and Twitter accounts are full of the Daphnes and Rolands who adore them. Investment in the talent and star-power of one individual certainly hasn’t gone away, and Coward’s mature and wonderful play reminds us that behind the celebrity there is still a complicated human being who wants to be worshipped and left alone, who needs to be managed but thinks they can cope without it, and who both loves and resents the impositions of fame. Traditional though it maybe, Unwin’s production and West’s superb performance finds new resonance in Coward’s writing, and while we may clamour for the new in London, there should still be a place for the old if they’re as charming as this. Present Laughter is a Theatre Royal Bath production currently on national tour. Having just completed its Richmond Theatre run, it moves to the Theatre Royal Brighton for its final week (8-13 August). The decision to have a child is something that most women will grapple with at some stage, but the notion that an individual has the right to decide what happens to their body is far from widely accepted. The politics of fertility are hugely controversial with many countries around the world still unprepared to ‘meddle’ with nature, while even here in the UK scientific intervention at any stage of a pregnancy or before can still be incredibly divisive. In society that is still fairly traditional at heart, through the media and all forms of popular culture we are constantly bombarded by the notion that all women want marriage or a long relationship with children – you can have your career and travel the world but by the time you reach your mid-30s (at the latest) this is all we should want to do. Culturally then we’ve ended up in a position of two extremes, at one end are the women who choose not have children at all and are still seen as odd or deluded – and who didn’t applaud Jennifer Aniston’s comments on this recently – while for those who have children there is an overwhelming pressure to be a pre-defined perfect mother. But there is a place in the middle that hasn’t been properly addressed, the women who desperately want children but can’t have them. Ben Elton considered this in his surprisingly moving 1999 novel Inconceivable but now Simon Stone’s new play at the Young Vic (which is in preview until Thursday) takes another look at exactly this issue and the all-consuming effects it has on one couple and their family. Yerma is based on the Federico Garcia Lorca 1934 play of the same name which Stone has updated and reset in modern London. Yerma and John are moving in together as the play opens, outwardly they have it all, a beautiful new apartment and a solid exciting relationship. But Yerma is 33 and begins a conversation about having a child, and as the months and years pass without success the couple are torn to pieces by her growing obsession. This is a tragedy in a true Shakespearean sense; a protagonist with a fatal flaw is driven to absolute destruction by an inability to see beyond their immediate context. And Stone’s production is incredibly powerful, at times disconcerting, alienating and devastating, it helps the audience engage with both perspectives understanding why Yerma’s family are so alarmed by her behaviour, but maintaining incredible sympathy for the pain of the women it follows. The action takes place in a glass box with mirrored ends designed by Lizzie Clachan, with the actors wearing microphones to allow the audience to hear them. Partially this represents the very public life Yerma is leading because, as a respected journalist, she is sharing the story of her reproductive problems with the world through her blog, which as the years pass becomes increasingly embarrassing and detrimental to her partner’s business. Like last year’s The Trial it uses a traverse style and presumably a treadmill to move sets between scenes, and having the audience face each other creates an even greater sense of the caged animal Yerma becomes, as well that notion of the whole world watching the ‘freak show’ as she lives her trauma in public. The play is also divided into chapters with some scene descriptions giving you a sense of how much time has passed and additional context which again reiterates this idea of something complex and unknowable being boiled-down into a linear story for public consumption. Stone’s interpretation of Lorca’s work is fresh and exciting, not just in the bang up-to-date references to very modern London including Brexit and our new mayor Sadiq Khan, but also in the use of technology particularly later in the play, to heighten the drama and impact. In a particularly impressive scene Yerma spirals out of control at a festival, high on drugs and losing her grip, while Stone drenches the whole scene with rain and uses strobe lighting to emphasise her heightened and manic state of mind. It doesn’t all work yet, occasionally the microphones muffle some of the text, particularly early on and a lot of the scene changes are quite long so there’s a lot of sitting in the dark waiting for things to happen, but this will quicken as the run continues. There’s also a potential problem of depth to the secondary characters – Yerma’s mother, sister, ex-boyfriend and younger colleague, as well as occasionally her husband John. It’s not quite clear whether they’re supposed to be fully functioning people in their own right or just become shades to Yerma as her obsession grows, in which case their lack of rounding is less important. But the production should be clearer about their purpose. 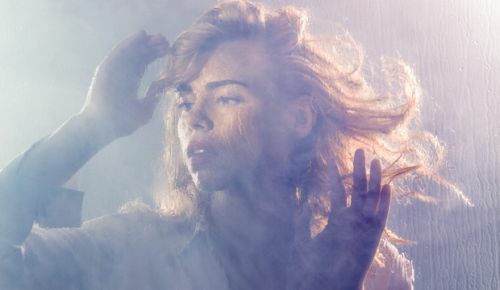 Billie Piper’s performance as Yerma absolutely crackles, dominating the production from start to finish. Piper has grown into a hugely watchable and skilled actor with a rare everyman quality that brings real audience engagement to all her roles, and amazing to think now that eyebrows were raised when she was originally cast as the Doctor’s companion. Here she initially seems incredibly relaxed, and her Yerma is a woman who has created a very nice life for herself, a bit smug maybe but with a nice committed boyfriend, a smart home and accelerating career success. Watching Piper pull that to pieces is like watching her pull petals off a flower – so easy and careless but needlessly destructive. And initially this Yerma takes the reproductive failings in her stride, but when the cracks begin to show in her marriage she becomes more and more like a caged animal, pacing around her glass jail, helplessly and entirely hopelessly trying to fight against her own biology. The performance becomes even more thrilling in the final third as self-destruction takes over, exposing the raw intensity as her obsession and pain get the better of her. But Piper expertly manages to retain a shred of audience sympathy even in the most extreme moments, making her final scenes pitiable and moving. Australian actor Brendan Cowell takes on the role of John, the often absent boyfriend / husband who perplexedly watches the women he knew change into something else. Initially, there’s not much too him as he floats in and out, but again this is a character that takes some time to build as we see the growing estrangement with his wife. Cowell is particularly good at showing us how John was almost railroaded into having a child he wasn’t that bothered about and how much easier it becomes for him to face the truth. But the real emotional punch comes much later as the relationship breaks down and Cowell shows us the wide-spread cost of Yerma’s obsession and the toll it’s taken on their once perfect lives. While the other actors have little to work with, special mention for Maureen Beattie’s unaffectionate mother who gets to represent an opposite and ironic view of motherhood as a women who never really wanted the children she had. With press night to follow later this week, Yerma looks set to reignite debates around fertility politics and a woman’s control over her body. Simon Stone has created an insightful and compelling vision that gives voice to the suffering and extremity that an unrealised desire for children can create. With a standing ovation for Piper’s performance after just a few previews, this is surely one of the most unmissable performances of the summer.